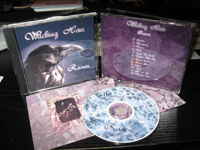 Raven is our brand new album. Released in October 2011 and is our first new recording in a very long time. Keep an eye out for brand new promo videos for tracks off the album, starting with Vampires Kiss and Blood inside. C.D: £10 plus £3 for post and packing. 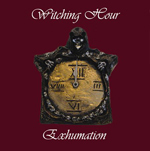 Exhumation is our very first album. Originally released back in the mid-nineties on cassette only, now digitally remastered and re-released on iTunes and C.D. 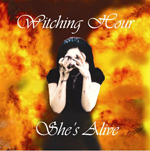 Hourglass our first E.P was originally released on vinyl only, with She's Alive our second E.P released on cassette only, both back in the mid-nineties. These have now also both been digitally remastered and re-released togther on one C.D and for digital download via iTunes. The original 12" vinyl edition of our very first release E.P, Hourglass. We have a limted supply of these left for sale and we have no plans to re-press, so once they are gone, they are gone, so get them while you can! 12" Vinyl E.P: £10 plus £3 for post and packing. Some of you out there may remember (or may be the proud owner!) of a Witching Hour t-shirt, back from when we did a very limited amount of them. We have had a lot of people ask about t-shirts (and other stuff like badges etc), so we do plan to do more t-shirts and stuff soon, we are currently exploring options, so watch this space! As with the t-shirts mentioned above, some of you long term fans may remember "The Early Hour", a compilation of promos and live Witching Hour footage that we released and sold on VHS. Well, we have had a bunch of people ask about this and with the imminent release of our brand new promo video, we have decided to do a DVD release of some sort. We haven't exactly decided what form it will take yet, or exactly what the DVD will contain, but it will hopefully be a remastered Early Hour, together with a bunch of brand new stuff and live footage. Again watch this space for updates!